Eye: Nickel Hourglass eyes, pearlescent with black pupils. 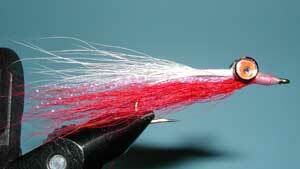 Notes: This streamer pattern originated with Bob Clouser of Middleton, Pennsylvania in 1984. 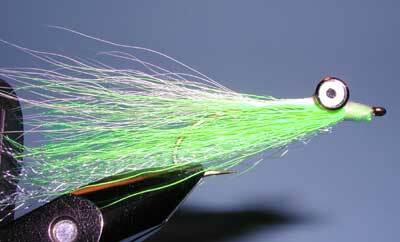 He originally designed the fly to catch small-mouth bass but soon found that it just about catches anything else that swims.Colors can be Black, White, Red, Yellow, etc. Mix the colors as preferred. His fly used dumbell-shaped eyes that causes the fly to retrieve "upside down". This assists in keeping the fly from snagging debris on the bottom but also gives the fly a jigging effect mimicing an escaping baitfish. 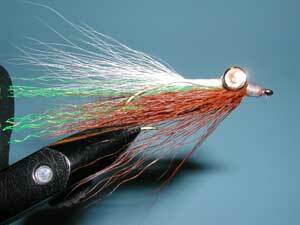 Bob sells many combinations of his minnow pattern at his web site at : Bob Clouser's Website. The body color is always a light color like white or yellow and becomes darker as you move up laterally. 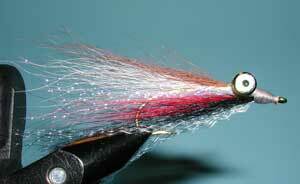 Since this fly uses weighted hourglass eyes, it will sink to the bottom rapidly, thus it is known as a Deepwater Minnow. 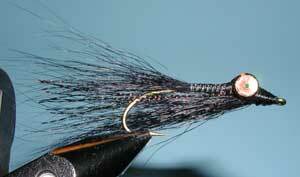 Use a slow to moderate retrieve to get the fly to dart and dive. Eye: Nickel hourglass eyes, red with black pupils.